Choose Protect-A-Child’s durable, impact-absorbent mesh and weatherproof components to maximize the safety of your pool fence. Zero failures with our pool fence's mesh and components in over 30 years. 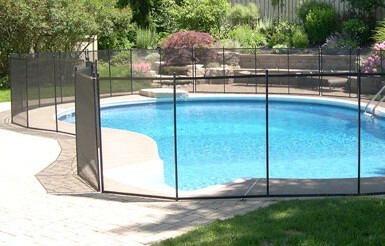 When you choose a Protect-A-Child pool fence, you get the ultimate in durability and aesthetics. Our mesh, borders and stitching are designed to be ultra-strong, and to remain taut for years to come—keeping your family safe, and your pool and fence looking beautiful, in your backyard. Your pool fence should first provide a barrier between your child and the water. However, this barrier also needs to be gentle on your little ones when they interact with it. Our fence is designed with a strong, yet forgiving, impact-absorbent mesh. This provides a cushion should they fall against it. Compare this feature with that of potentially harmful rigid fences, such as glass, rail, wood, and chain link. Choose the fence with safety features that go beyond barrier safety—choose Protect-A-Child. Curious toddlers need only a gap or opening in a pool fence to catch their interest and provide an opportunity for dangerous exploration. The weave of our mesh is too small for tiny fingers or toes to gain a hold for climbing. They can’t reach through or under, and toys stay on the safe side of the fence to keep their attention away from the pool. Unlike rail fences, Protect-A-Child’s mesh design along with its strong fiberglass posts make it so difficult to climb, children typically don’t even try. When you choose Protect-A-Child, you get a pool fence made with 1,000 denier PVC-coated polyester mesh—the most UV-resistant, field-proven mesh available. Our mesh has a burst strength of more than 400 lbs, so you don’t have to worry about your children breaking through to the pool. Plus, its basket weave construction gives it self-healing capabilities that allow the fence to retain a perfect, attractive shape. Our customers can attest that their fences remain strong and taut year after year and don’t rot in the sun like other fence mesh. 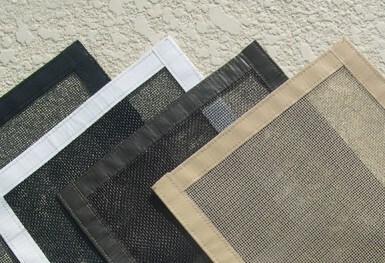 Plus, our mesh also provides additional antimicrobial protection! You enjoy looking at your beautiful swimming pool, right? Why would you want to shield it from view or even give it a “behind bars” look with a chain link or rail fence? Protect-A-Child’s 98% transparent mesh pool fence provides a clear view of your pool—allowing you to enjoy the beauty of your backyard and clearly supervise children playing in the pool. The optimum size mesh weave, straight installation, fence strength, and transparency all combine to give your fence superior performance and appearance.